Mostar: Bosnia’s favourite city. The mixture of Ottoman and Croatian influences on either side of the Neretva River beautifully juxtaposes against the rocky canyons in the distance. Tourists continue to flock the city, and local establishments have stepped up in offering the best travel experience – accommodation chief among them. Here’s a list of some of the best boutique hotels for the perfect trip to Mostar. If you’re after a high-quality boutique hotel near Stari Most, Hotel Old Town Mostar is one of the best options. Located just 200 metres from Stari Most, Old Town mixes the traditional with the luxurious. Stone and wooden décor on the interior along with old-fashion furniture generate a special atmosphere inside this small hotel. You have a choice between twin, double rooms, and a suite with an optional balcony. Everything at Old Town Mostar makes you feel like you’re back to a bygone age. The restaurant has both indoor and outdoor seating areas in the garden, which is perfect on a warm summer’s day. Hotel Boutique Pellegrino has the perfect location in downtown Mostar, inside the pedestrian area near Stari Most and Musala Town Square. You can choose among 14 rooms consisting of 12 studios and two standard bedrooms, with each having the essential amenities and free Wi-Fi. Visitors often cite the full-buffet breakfast as one of the highlights of their stay at Boutique Pellegrino. The Muslibegovic House combines a Bosnian National Monument and museum with a boutique hotel inside a 17th-century building. Guests stay in one of the 12 luxurious rooms that have decorations to preserve the authenticity of the building. All rooms come with a modern en-suite and complimentary Wi-Fi. The museum itself has an extensive collection of Ottoman relics and centuries-old calligraphy, whereas the rose garden provides a pleasant place to relax. You won’t find a better experience in Mostar than spending a few nights at Muslibegovic House. 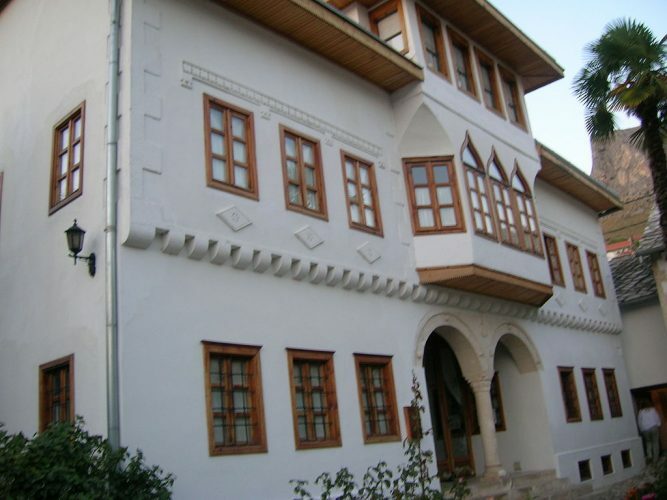 The Bijavica family, whose ancestry in Mostar dates back to the 16th-century, runs the eight-roomed Villa Fortuna. In order to preserve the heritage of their Herzegovinian forefathers, the Bijavica family created a hotel with décor and styles resembling their older traditions. Anyone who stays here will feel the atmosphere of the olden days radiating from the very essence of this boutique. The location is ideal, too, being just 500 metres (1640 feet) from Stari Most. Visitors can choose among twin, double, or triple rooms, and a one-bedroom apartment with a balcony. All rooms have a flat-screen TV, air-conditioning, and a fridge. Villa Fortuna goes the extra mile with their guests to provide the traditional experience. If you stay here, you have access to their hotel garden and can visit their on-site stone house, which contains multiple historical artefacts. Hotel Bevanda is a short walk from Stari Most and Cathedral of Mother Mary, nestled inside a quiet, leafy neighbourhood in the foreground of the mountains. A total of 33 rooms ranging from doubles, twins, and family suites have individual decorations and interior designs. Each room has a balcony, safe, and minibar while the on-site restaurant, with an outdoor terraced seating area, has a selection of both local and international dishes. Couples usually give Hotel Bevanda a high rating because of its romantic feel. As many as 16 rooms, comprised of singles, twins, doubles, and triples make up Hotel Almira. Its two outdoor terraces provide visitors with excellent views of Stari and Mehmed Pasha Mosque. Relaxing with the magnificent views is the main highlights at Hotel Almira. You can also arrange tours or get suggestions on the best things to do in Mostar, too.